1. Email janicu[at]gmail[dot]com with the subject SHUT OUT GIVEAWAY, and say “please enter me” or something like that, and that should be it. No hoops, although if you found this blog via this giveaway, I’d be thrilled if you did subscribe. You and I are using the same WordPress theme.. Cool! I would love to win your ARC of Shut Out.. 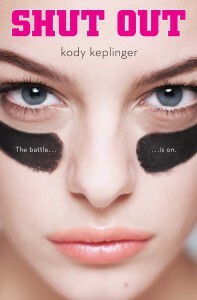 I love Kody’s writing when I read The DUFF and I’m sure I’ll love Shut Out. Anyway, please, please put my name in for the giveaway..
Hello there! Yup, this is a nice theme! Thanks for stopping by, and I’ll add your name to the contest hat. Good luck. Thank you Janicu! Thanks so much..